My family has been Harry Potter fans for awhile now. My daughter has read all of the books, including Fantastic Beasts and Where to Find them and The Cursed Child, at least once. My oldest son and I just finished reading the illustrated Prisoner of Azkaban. We have watched most of the movies together and even threw my daughter a Harry Potter themed birthday party. 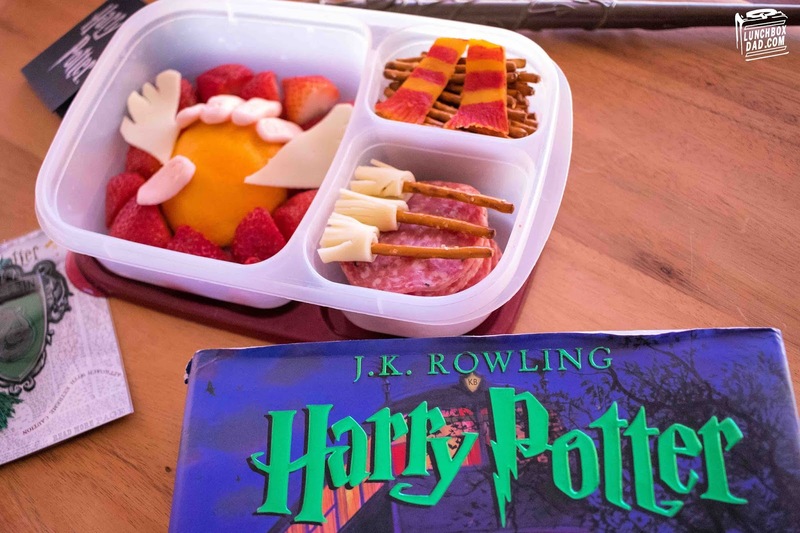 This isn't the first time that I've made my kids a Wizarding World lunch, you might have seen my Dumbledore, Hermione Granger, or Hogwarts Express lunches, but I figured it was time for a new one. Since we were reading The Prisoner of Azkaban, and Gryffindor won the Quidditch Cup against Slytherin, I knew what I had to do. If you've read the story you know that Harry wins the big match by reaching out and barely grabbing the Golden Snitch before Malfoy does. After I put my son to bed, I immediately started dreaming up what a lunch based on this part of the story would look like. What you see here in this post is what I came up with. 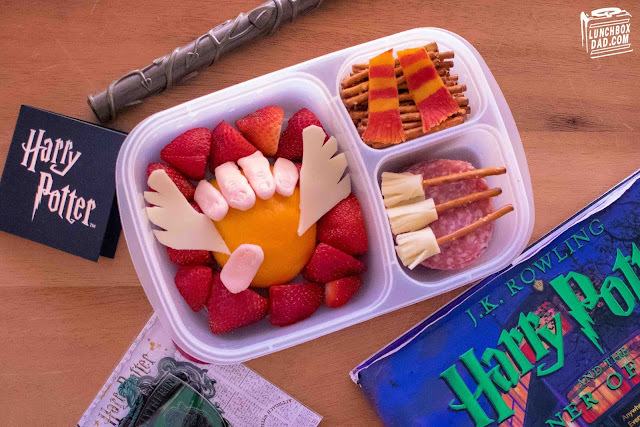 I honestly had a ton of fun with this lunch because I focused on the Snitch being caught instead of Harry who caught it. Although I'm sure the Firebolt broom would have looked differently, the Quidditch brooms and house scarf were pretty fun as well. I made this all in an Easy Lunch Boxes container. Read the ingredients and directions below! 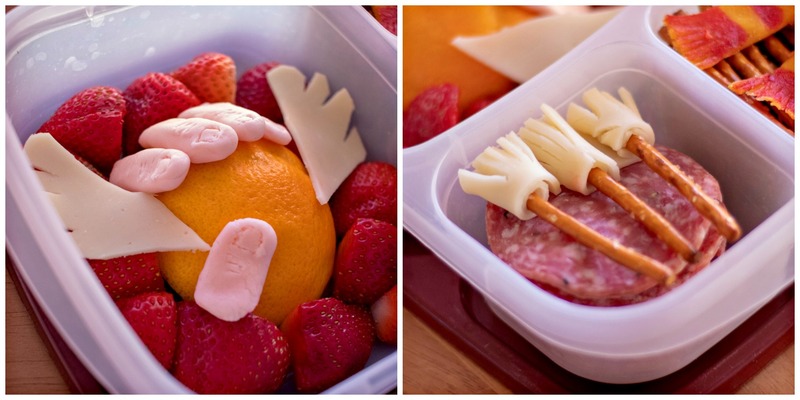 Ingredients: Half an orange, sliced strawberries, sliced white cheese, natural colored fondant, crackers, salami, pretzel sticks, dried mango, red food coloring marker. 1. Place orange half in main compartment of lunch box and surround with strawberries. I used strawberries to represent Gryffindor. 2. Cut two wings from slice of white cheese. Place on top of orange and strawberries to make the Golden Snitch. 3. Use natural colored (skin tone) fondant to form four fingers and a thumb. Arrange them around the Snitch to create the illusion of Harry grabbing it out of the air. 4. Alternate salami and crackers in a side compartment. Cut a narrow strip of cheese and roll it around a pretzel stick. Cut the bristles of the broom and place on top of the salami and crackers. Repeat with two more brooms. 5. Drop pretzel sticks in second side compartment. Cut dried mango into two strips and color res stripes with food coloring marker. You can also use red food coloring on a toothpick. Arrange on top of pretzel sticks to make Gryffindor scarf.